See Plant Guide to Bright Angel Trail for an introduction to this page. Identification status: The species is determined with high confidence, but the variety remains to be determined. 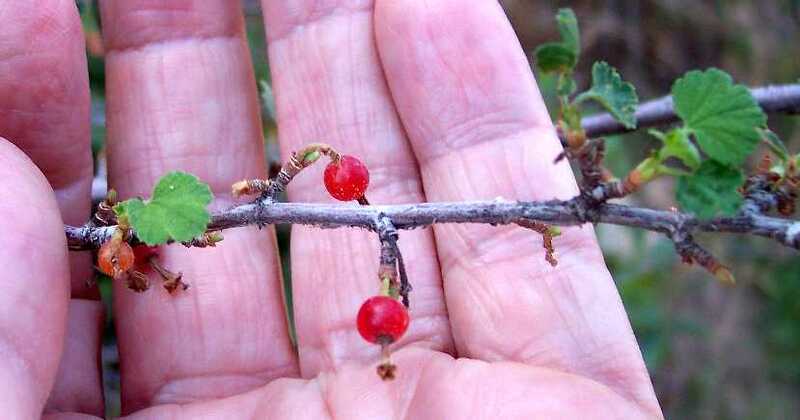 From the McDougall key, there is only one other currant species at the Grand Canyon, Ribes viscosissimum, which has deeply lobed leaves usually wider than 2 inches (4 cm), and fruit that is black at maturity. R. cereum has shallowly lobed leaves usually much less than 2 inches (4 cm) wide, and fruit that is red at maturity. I measured the leaves as being typically 1.9 cm wide, the leaves are shallowly lobed, and the fruit is red at maturity, making the determination R. cereum with high confidence. There are two varieties of Ribes cereum: var. cereum and var. pedicellare (=R. inebrians). They are distinguished by the shapes of the bracts of the flowers, which were not available for examination in September. From a SEINet search, there are 34 vouchers of this species from the Coconino County portion of the Grand Canyon, including two from elevation of 5000 and 5700 feet on this trail, and another from Under Canyon Rim near Grand Canyon (town). All of those vouchers are determined only to the species, which may imply these are var. cereum. Note that there may be additional vouchers at other herbaria not available through SEINet. There is only a single voucher of var. pedicellare, as R. inebrians, with a location just specified as Grand Canyon. The 1987 Grand Canyon Flora reports a nearby location in the vicinity of Grandview, South Rim. Due to the much larger number of probable var. cereum vouchers, I've tentatively put down that variety in the plant guide, but with a ssp on that determination indicating that the variety needs to be confirmed in the future. First occurrence on Bright Angel Trail: mile 0.00, elevation 6845 feet (2086 m). Number of plants along Trail: at least 40 plants were found in at least 9 different locations in September 2007. This is a very common species on the trail. The following picture shows the same plant, with a different view to expose the rest of the plant that was in the shade. The stem seen in the first picture is now overexposed.